Working on a few series of Artist Trading Cards. 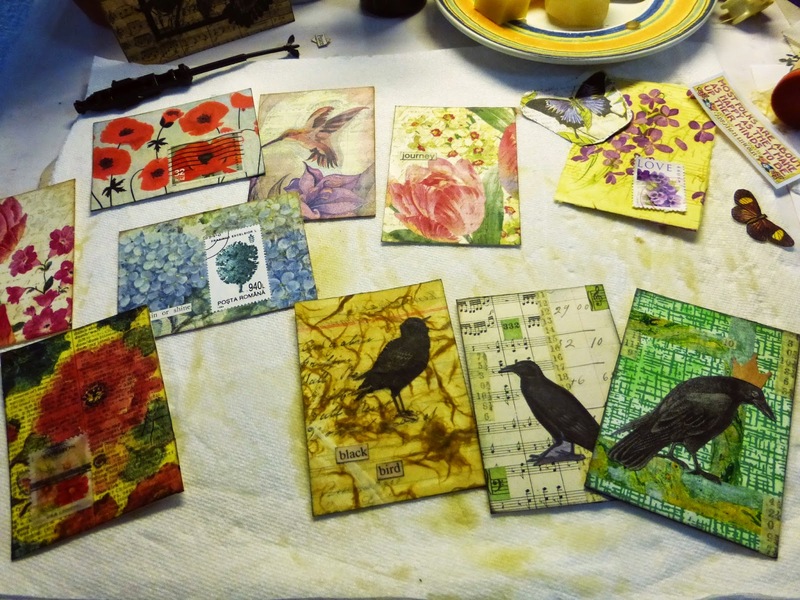 The flower cards are potentials for my friend Martha's Spring Flowers swap. I'm hosting a recycled envelope swap at ATCsforAll.com, so that's what the corner blackbird is about. I'm in search of some red or pink security liners, came across one at thought I'd saved it but can't locate it. Ah well! On another note, I dropped off my Orange Flowers painting for the Allied Arts Members Show that opens Friday March 6th. So it's not here, but it's on my mind. I thought I had a photo of it framed, but can't find that either. Gosh, wonder if all this "can't find stuff" is part of getting old. Nah, just busy. That's it! Sharing with Julia's What's on Your Workdesk.